Want to makeover the entire look of your interior, without the expense, mess and hassle of remodeling? Then quality window treatments are exactly what you need. More importantly and specifically, the team of experts here at your local Concord window blinds and shutter company, Sweet Shutters and Shades is what you need. We take great pride in the work that we do and that is evident from the results that we are able to deliver, for each of our clients. Our goal is always to meet and exceed the expectations that you have by delivering better results than you had even hoped for. Selecting just the right window covering is a vital part of transforming your current house into the home of your dreams. With over 20 years of industry-related experience, company owner, Diane Sweet, is able to ensure that each customer is nothing short of 100% satisfied. We take you through each step of the process, helping you make important decisions. Finally, our shutter company provides you with high quality, customized products that are expertly installed for you. There are plenty of great reasons that shutters remain such a popular choice among homeowners to this day. At Sweet Shutters and Shades, we offer both plantation shutters and polycore shutters in Concord, NC. Either choice is one that you will love and be glad you have implemented into your home's interior and exterior look. Shutters offer the best in both thermal and sound insulating capabilities. They also offer the maximum abilities for both privacy and light controls. Besides just making your home look good, they also add to the overall property value of your home – so choose wisely and with expert advice. You have such a vast selection to choose from, when it comes to styles, colors and patterns. Even the material options are numerous, such as aluminum, vinyl or wood, just to name a few. While the ability to adjust for light control and privacy may not be as flexible as shutters, it is a close second. 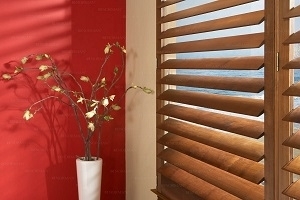 Blinds have slats that help control light and privacy. This also enables you more options than just opened or closed. They are versatile because they can either blend in as background or steal the show. Choose subtle blinds in neutral tones if you want the focal point of the room to be something other than your window treatments. Or, opt for vibrant patterns and bold colors if you want your blinds to be the highlight of your space and even make a statement from the exterior. If you are looking for an experienced Concord shutters or window blinds professional then please call 704-980-4303 or complete our online request form.